Transform yourself into a successful blackjack pro using our tips! Transforming yourself into a successful blackjack pro is about doing, not dreaming. Here are some concrete steps to help you get there. We all dream of becoming a successful pro blackjack player, winning loads of money at casinos and even writing a bestseller on advanced strategies like shuffle tracking or card counting systems (I haven’t quite made it to that level, but I’m working towards it!). But if you want to make serious progress with your blackjack playing and eventually elevate your game to the professional level, you’ve got to do a lot more than dream. I’ve compiled a list of crucial steps you need to take in attempting to become a blackjack superstar. Whether you’re an absolute beginner or a skilled basic strategy player trying to push things to the next level, the most important thing is to be constantly working to improve your skills. We can make a pro player of you yet. Getting basic strategy down pat is the absolute first step you need to accomplish before you can even think about winning money consistently at a land-based or online casino. I couldn’t tell you how many people I’ve come across over the years who want to learn how to count cards but don’t even have the ins and outs of basic strategy figured out. These days the internet is full of blackjack strategy charts, including the one at our site. It’s simply a matter of dedication. Spend at least an hour or two every evening learning when to hit, stand, split, surrender and double down. You’ll never make money card counting if you make mistakes in the basics of blackjack. The internet is chock full of great casino sites offering a range of blackjack games with lower house edges than you’ll find at any land-based casino. You can even practice with free-to-play games. This is a perfect way to develop your skills in a low-risk, low-pressure situation. In fact, most experts recommend spending at least a month honing your skills online before moving up to the big leagues. Some reputable sites that we recommend playing with are Bet365, Bovada and Bodog. Once you’ve progressed to the point that you can win consistently online, start playing at the nearest casino. Ask any professional blackjack player and they’ll tell you that they learned a lot of what they know from reading the best blackjack card counting books. While a lot of what’s out there is low-quality written by hacks (remember, a lot of these guys make money writing, not playing blackjack), the right book can do wonders for your game. Reading some of the best blackjack books helps you to become a pro! 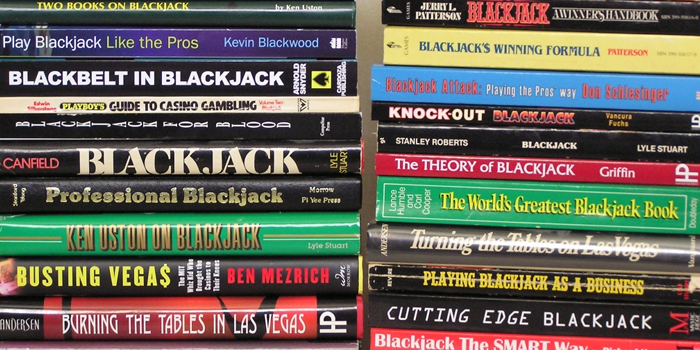 Some blackjack books we recommend to aspiring pros are Playing Blackjack as a Business by Lawrence Revere, Beat the Dealer by Edward O. Thorpe and Million Dollar Blackjack by Ken Uston. All three are insightful studies into both the theory and practice of blackjack by some of the greatest players in history. Of course the best way to develop your skills is to drill endlessly, but getting some background knowledge can only help. Once you’ve perfected your knowledge of basic strategy and hit the books to boost your blackjack basic strategy, you’re ready to start card counting. But you need to spend countless hours drilling at home before your skills will be good enough to win you money at a casino. The first step is to work on your visual recognition skills. You need to be able to count cards quickly and without mistakes. Mentally counting is too long and clumsy, so you need to be able to do everything with your eyes. If possible, have a friend shuffle cards for you while you keep count. Experts say that you should be able to count down a full deck without errors in 20 seconds before you’re ready to win money at the casino. Knowing how to count cards effectively is one thing. Being able to do it without getting booted out of the casino is another. Lots of guys know the mechanics of keeping a count but lack the casino table manners to be successful once on the casino floor. You need rock-solid concentration in order to act like every other player at the table. One good technique for this is to practice counting at home while holding a conversation. If you can debate politics or discuss the finest works of Shakespeare or Dostoyevsky while keeping a flawless count, you’re ready for bigger and better things. You also need to learn how to “spread” properly, something that is difficult even for many pros. This refers to the difference in bet size from when the count is low to when it’s high. Increasing your bet from $10 to $200 is going to tell the dealer that you’re counting, but going from $10 to $20 isn’t going to win you much money. You need to find a happy meeting.